Researchers say that the dark entrances to 6,000 year-old tombs in Portugal could have been an early form of astronomical tool that enhanced the visibility of the stars. 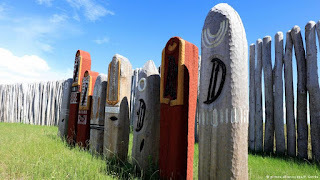 In particular, they say, the orientation of the entrances to the passage graves suggests that they are aligned to offer a view of Aldebaran, the red star that is the brightest body in the constellation of Taurus. The star might have been important to ancient communities who moved their herds and flocks to summer grazing grounds in the mountains each year. The annual event, the researchers argue, could have coincided with the star’s first appearance in the morning twilight each year. “This first rising of Aldebaran occurred at the end of April or beginning of May 6,000 years ago, so it would be a very good, very precise calendrical marker for them to know when it was time to move into the higher grounds,” said Dr Fabio Silva of the University of Wales Trinity Saint David. THE DAY OF ARCHAEOLOGY 2016 WILL BE HELD ON FRIDAY 29 JULY! We are looking for people working, studying or volunteering in the archaeological world to participate with us in a “Day of Archaeology” in July 2016. 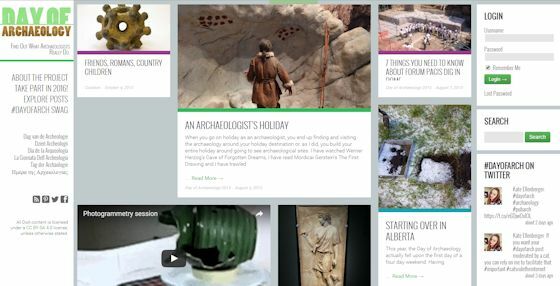 The resulting Day of Archaeology website will demonstrate the wide variety of work our profession undertakes day-to-day across the globe, and help to raise public awareness of the relevance and importance of archaeology to the modern world. 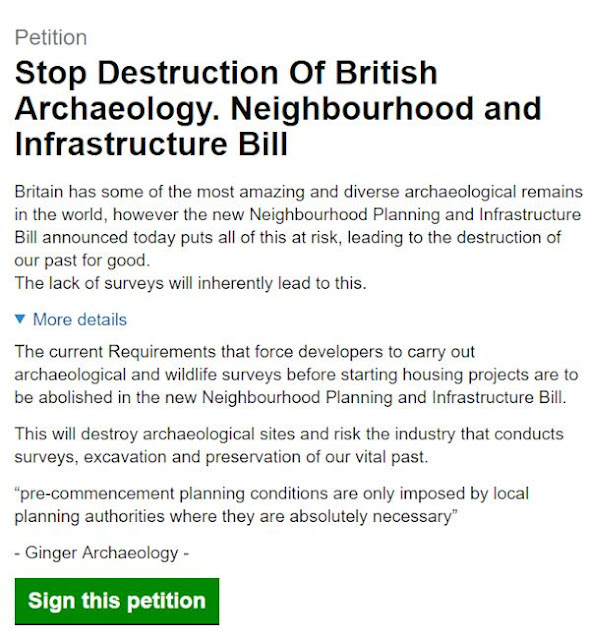 We want anyone with a personal, professional or voluntary interest in archaeology to get involved, and help show the world why archaeology is vital to protect the past and inform our futures. One of the most important relics of the Bronze Age, an ancient site known as the German Stonehenge, has opened to the public after years of reconstruction. The "Ringheiligtum Pömmelte" as it is known thanks to its location near the eastern German town of Pömemlte, celebrated its opening as a cultural site on Tuesday (20.6.2016). The formation, known as the Stonehenge of Germany, is estimated to be around 4,300 years old and was discovered in 1999 in the forest near the banks of the Elbe River. Made of wood, the archaeological wonder has not withstood the test of time well and has since been entirely reconstructed at a cost of 2 million euros ($2.27 million). The boundaries of the Roman Empire have been expanded following the discovery of Roman coins in a rural village. Amateur metal detectorists Jim Wills and Dennis Hewings first unearthed the coins in Ipplepen, Devon, in 2009. Now archaeologists have uncovered a Romano-British settlement which had trade links to the rest of the Empire. Dr Sam Moorhead, from the British Museum, said the site raised "a whole series of new questions" about Roman Devon. Italian and French archaeologists have discovered four skeletons and gold coins in the ruins of an ancient shop on the outskirts of Pompeii, officials said Friday. Three gold coins and a necklace's pendant were scattered among the bones. In the workshop was an oven which archaeologists think might have been used to make bronze objects. A previously undiscovered Roman cemetery has been found by archaeologists working on a Lincoln city centre site. 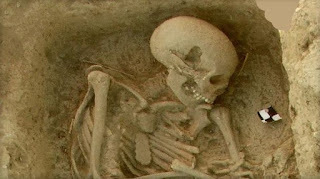 The skeletal remains of two babies and an adult, plus ashes in an urn, were uncovered by the team preparing the ground for the University of Lincoln's new Sarah Swift building. 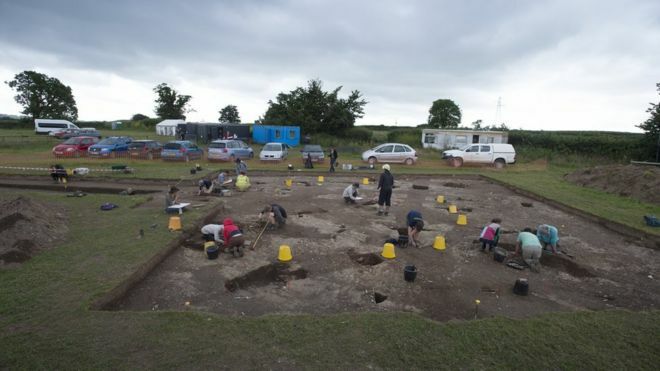 And archaeologists working on the land between High Street and Brayford Wharf East are excited because the major finds further emphasise the importance of Lindum as a Roman centre. City archaeologist Alastair MacIntosh said: "Previous archaeological work in the area has revealed evidence of Roman buildings dating from the 1st century onwards. And until now it was thought that the area was only used for housing, so this is an exciting discovery." There are still a few places left on this field trip. The historic discovery two years ago of a fifth Viking ring fortress was celebrated in grand style on Monday. After lying forgotten for over 1,000 years, archaeologists uncovered a circular Viking fortress just west of the Zealand town of Køge in a find that shook up popular knowledge of the Viking Age. Researchers had long assumed that the four previously discovered Viking fortresses were all that remained in Denmark and the September 2014 find was the first of its kind in 60 years. On Monday, Queen Margrethe officially unveiled the fortress, dubbed Borgring. It opens to the general public on Wednesday, June 1st and is expected to draw upwards of 30,000 visitors per year. 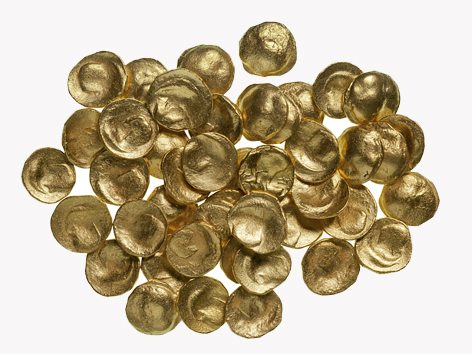 Three amateur archaeologists have uncovered the largest ever trove of Viking gold in Denmark. The three archaeologists, who call themselves Team Rainbow Power, found seven bracelets from the Viking Age in a field in Vejen Municipality in Jutland. The bracelets, six gold and one silver, date to around the year 900. With a combined weight of around 900 grammes, the find is the largest ever discovery of Viking gold in Denmark. Team Rainbow Power member Marie Aagaard Larsen said that she had only been on the field for around ten minutes before striking gold – literally. Some of the Roman sling bullets found at the Burnswark Hill battle site in Scotland. The two smallest bullets, shown at the bottom of this image, are drilled with a hole that makes them whistle in flight. 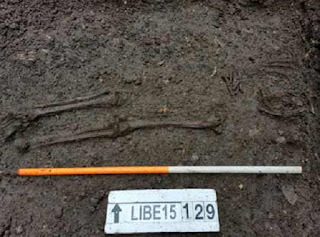 Cremations, inhumations and graves accompanied by shield bosses, knives and spearheads were among the 77 burials at one of the largest Saxon cemeteries ever discovered in Wessex, say archaeologists who have released their findings at the site after re-examining a tricky terrain first excavated during the 1970s. 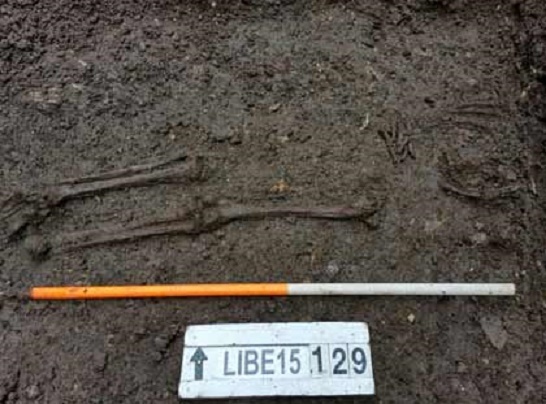 A local woman alerted the local council in the village of Collingbourne Ducis when she saw bones protruding from the ground at a housing development site in late 1973. More than 30 graves were found there by archaeologists in 1974, with a further 86 – believed to date from between the 5th and 7th centuries – uncovered in 2007. Denmark's main museum says amateur archaeologists have found seven bracelets - one of silver and six of gold - which are considered to be the largest Viking-era gold find in Denmark. National Museum of Denmark spokesman Peter Pentz says finding one "is huge but it is something special to find seven." 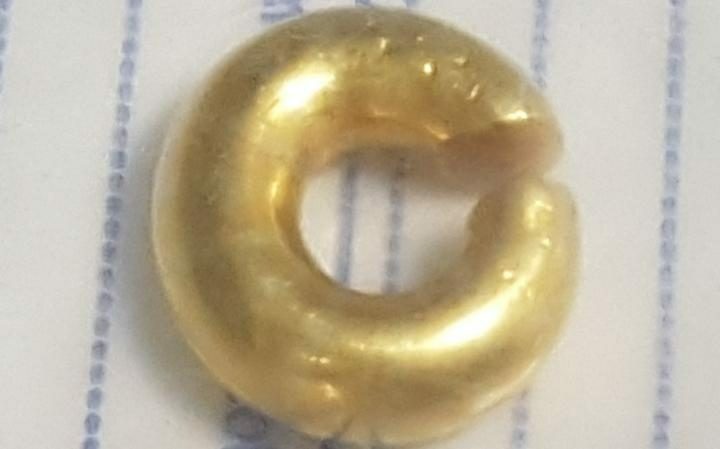 Pentz says the bracelets weighing a total of almost one kilogram (2.2. pounds) were discovered last week near Vejen in western Denmark by people using metal detectors. He said in a statement Thursday the bracelets could have been used by a Viking chieftain to reward faithful followers. They likely were part of a treasure that includes a gold chain found in the same field in 1911. Major breakthroughs in our understanding of the Picts, the “lost” ancient people of Northern Scotland, and their possible interaction with the last Romans in Britain have followed the discovery of a hoard of Roman silver in Aberdeenshire. First uncovered in 1838 and again in 2014 and now known as the Gaulcross Hoard, the items discovered over the past 18 months now extend to more than 100 silver coins and objects. 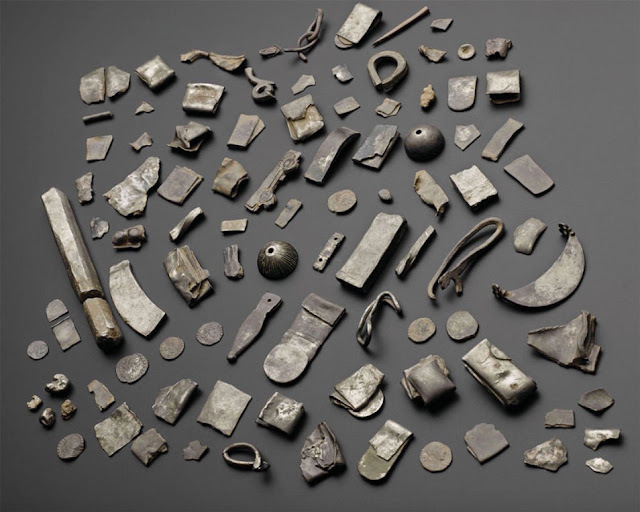 What is exciting archaeologists and historians is that although the hoard is Pictish in origin, the metal itself is Roman and includes Hacksilber, fragments of cut and bent silver items that were often used as currency by the Romans. 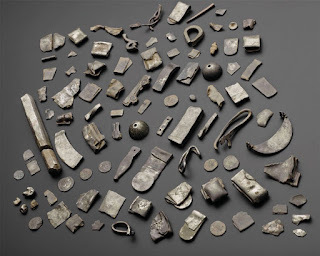 The suggestion by the discoverers is that the Gaulcross Hoard was originally in high-status Roman hands and that the Picts acquired them either through looting, trade or military means. 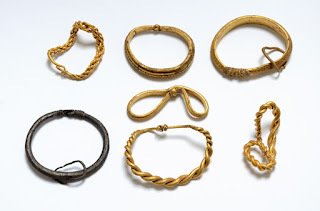 Last week three amateur archaeologists found seven bangles from the 10thcentury in a field near Vejen in Jutland. The amazing thing is that six of the seven are made of gold, while the last is of silver. – When we discovered the first ring, we really felt that we had found the gold at the end of the rainbow. And then more surfaced; it was almost unreal, says Marie Aagaard Larsen, who together with her husband Christian Nedergaard Dreiøe and their common friend Poul Nørgaard Pedersen is one of the three happy finders. It took only about ten minutes to find the first three bangles; afterwards a phot was sent quickly to the local museum in Sønderskov where the curator was quick to secure the place. 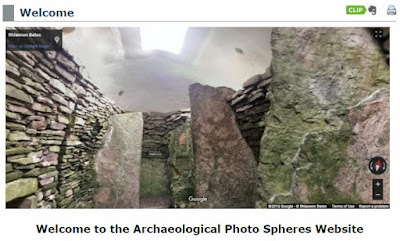 A new website providing links to archaeological photo spheres is now online. 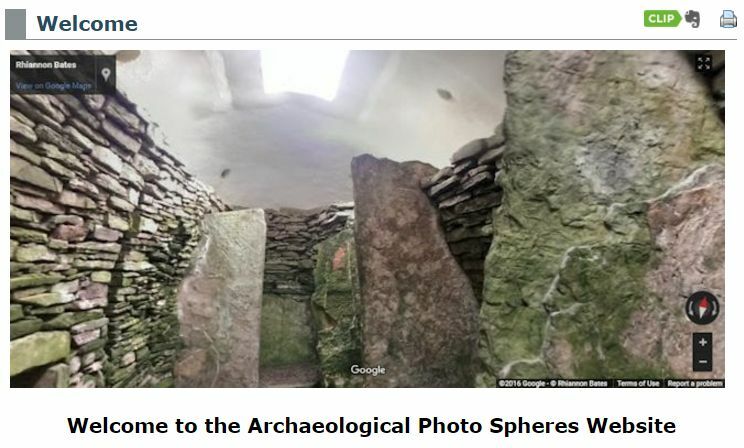 The purpose of the site is to make these photo spheres easily available and also to encourage people to make archaeological photo spheres and publish them on the site. Archeologists from NIKUnorway working in the well. “This is truly astonishing. As far as I know there is no known example of the discovery of an individual historically connected with an act of war as far back as the year 1197. And the fact that this actually corroborates an event described in Sverre’s saga is simply amazing“, says lead archaeologist at the site, Anna Petersén. This undated picture provided by the Paliambela Excavation Project Archive, shows a human burial from the archaeological site of Paliambela in northern Greece. BERLIN -- Stone Age people from the Aegean Sea region moved into central and southern Europe some 8,000 years ago and introduced agriculture to a continent still dominated at the time by hunter-gatherers, scientists say. The findings are based on genetic samples from ancient farming communities in Germany, Hungary and Spain. 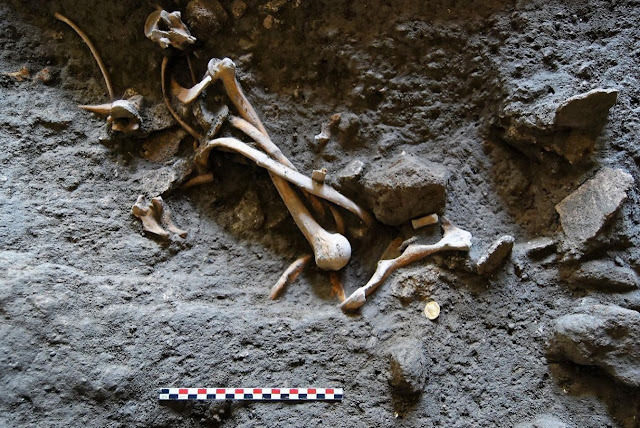 By comparing these with ancient genomes found at sites in Greece and northwest Turkey, where agriculture was practiced centuries earlier, researchers were able to draw a genetic line linking the European and Aegean populations. The study challenges the notion that farming simply spread from one population to another through cultural diffusion. The findings were published Monday in the Proceedings of the National Academy of Science. 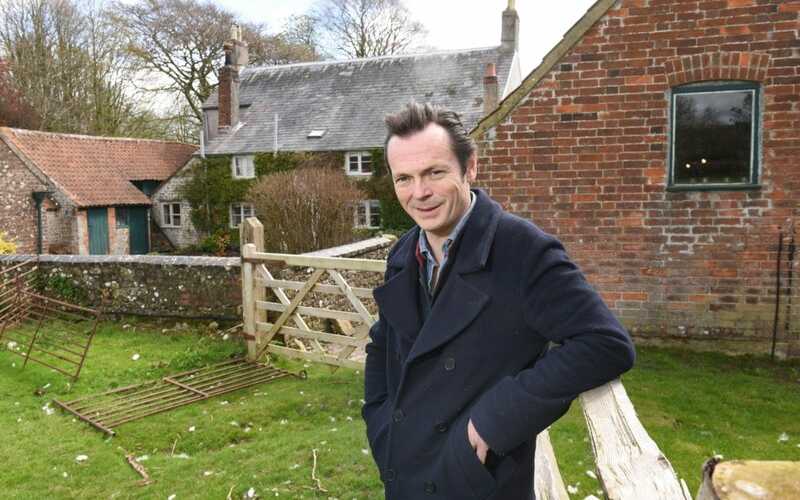 When Luke Irwin discovered evidence of a palatial second century Roman villa in his quiet corner of Wiltshire, he wasn’t prepared for the world’s reaction. The chance nature of the find in his back garden, which was exposed last February when a stretch of vividly coloured mosaic was uncovered during wiring work, certainly made for an attention-grabbing story. But what was less predictable was the speed at which it spread around the world after he went public with the news in April this year. Within a couple of days, the internet was agog with debate (“What are ancient Roman luxury villas going for nowadays?”) and Irwin’s video about the discovery and excavation of the site – previously a sheep field – had been watched by thousands of people. Things became truly surreal when Fox News introduced the villa to America as “the opulent home of a Roman-era 'Kardashian’ family”. Archaeologists have unearthed gold treasure in Austria thought to be worth as much as €50,000. The 44 Celtic gold coins, weighing 7.5 grams, were found on a site in Traun, near Linz in Upper Austria, that was being excavated before the building of a machinery hall.